Survivors and relatives of the victims of one of Britain's worst maritime disasters have remembered loved ones at a special memorial service. 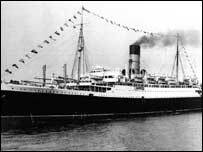 The Clyde-built former Cunard liner, Lancastria, was lending support to the war effort when it was attacked by German bombers on 17 June 1940. The ship had been evacuating British Expeditionary Forces from France. About 4,000 people died, including 400 Scots. The service took place at St George's Church West in Edinburgh. The Lancastria was carrying about 9,000 troops when it was sunk by German bombers off the coast of France in 1940 during a mass evacuation. The wreck now lies about five miles from the French coastal town of St Nazaire in about 20 metres of water. The service, which was the first to be held in Scotland to the victims, was held on Saturday. Among those in attendance was Lancastria survivor Charles Napier, 88, from Inverurie, Aberdeenshire. He said: "It was a good service and I was very affected by it. "I was a Royal Engineer and coming home from France when it happened. "I had quite a few friends on board and it's a day that we all try to forget." The French Deputy Consul General, Scotland's Lord Advocate Colin Boyd and a number of MSPs were in attendance. These included Christine Grahame of the SNP who gave the eulogy. The South of Scotland MSP said afterwards it had been a "very moving" event. "Very few people know about the Lancastria because it was kept quiet for propaganda reasons at the time, which was understandable." She said she now wants a permanent memorial to the converted liner in Scotland. 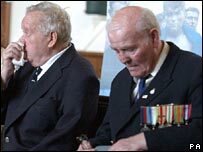 "I've called on Jack McConnell to erect a memorial at the site where it was built in Clydebank." This is now occupied by the Golden Jubilee hospital. Simultaneous services also took place today in London and St Nazaire. It is believed the Scots who died included members from units such as the Argyll and Sutherland Highlanders, the Black Watch and Fife and Forth Yeomanry. The Lancastria Association of Scotland, which held the service, is campaigning for greater public recognition of the disaster and urging the UK Government to designate the wreck of the Lancastria a war grave under the Protection of Military Remains Act. The French Government recently decided to give the wreck special protected status, preventing any diving within 200 metres. As the wreck lies in French territorial waters, it precluded the Remains Act being used, as this only applies in UK and international waters.